Delivery time: Your item will ship within 2 business days. This full sole leather ballet flat comes with print cotton lining featuring a charming hearts design. 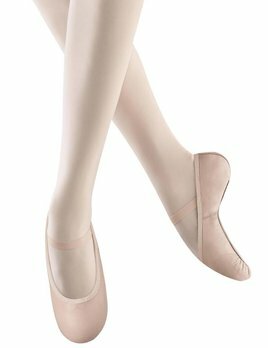 Pre-sewn elastic and no drawstring ties make this the perfect shoe for the dancer on the run! This full sole leather ballet shoe is perfect for beginners! Charming heart design lining with pre-sewn elastic and no drawstring ties to slow your ballerina down. This shoe is a great basic to have!